To steal a bite from the Knitmore Girls, this is a “when knitting attacks” story. This is my first no-pattern sweater. I have taken sweater classes from Ysolda Teague and Jared Flood on knitting and designing sweaters. I’ve been wanting to make my own design for a long time and this thunderstorm swater is the perfect project because it’s small, so if I make mistakes I won’t mind too much ripping out. And my son had specific wishes that required a custom design. See this post for his drawing. I spent a long time drawing, measuring, swatching, calculating. I bought the yarn I would need. I had a new set of needles and finally the moment came where I felt confident enough to cast on. The amount of love that has gone into this sweater before even one stitch has been cast on is immense. I gave myself two months before my son’s 5th birthday, PLENTY of time to finish a child’s sweater on size 10 needles, or so I thought. I got an inch into it and felt so delighted. The Malabrigo feels great, I love the new needles I’m working with , and most of all I’m finally making progress on the most special knitting project I’ve ever done because my son designed it. I figure this will be my on-the-go knitting until I get to the bottom of the cloud. So, I take it everywhere, but never really have a chance to work on it until a week later. Finally, some free time. I go to grab my project bag. But, wait… where’s my project bag? In the car? No. Under the bed hanging out with dust bunnies? No. At the grandma’s? No! My anxiety levels are rising. In any of the stores I have been to in the last WEEK?? NO!! The UNTHINKABLE has happened. Denial sets in. It will surely turn up somewhere. I will sick “the finder” (aka my husband) on it and I’m sure he will find it in under two minutes. That’s his specialty. He is confident too which eases my fear. Until, even he can’t find it anywhere. I have lost my project bag, but I will not admit this to myself for another month. Each week I report to my knit night group, I still haven’t found my bag secretly waiting for it to present itself in one of those right-under-my-nose kinds of ways. 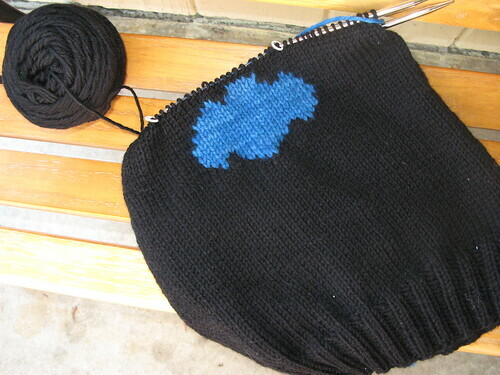 The cloud, I realize, has to be done in intarsia. Fine, I’ve done intarsia once before, no biggie. Note to self, intasia can’t be done in the round! The yarn ends up on the wrong side when you complete the circle. I knit and tinked a bunch of times until I come up with a work around. I figured I will just purl back for the length of the cloud and put in a small side seem in this section. I consult ravelry foums and this seems to be an acceptible solution. I made it work and finished the cloud (painfully, intarisa is not one of my favorite knitting techniques, but the yarn behaved itself for the most part). I held up the sweater to view my work and…. the cloud is disproportionally small and it looks more like a bat than a cloud. My son promptly proclaimed, “It IS a bat Mommy!” This would be all find and dandy if I was designing a batman sweater, but this is a thundercloud sweater, it should look like a cloud! It is now 2 days away from his birthday, no sleeves done, no yoke done, the tiny bat/cloud looks silly… it is over. I will not be able to finish this in time for his birthday. It’s ok though. I am still going to finish this labor of love… probably not in time for Christmas, but it will happen soon. The knitting itself is delicious and fast. 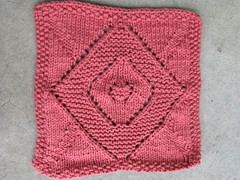 I have decided to just do the entire sweater in black and do duplicate stitch for the rest. I have some practice with duplicate stitch, hopefully that won’t attack me as well. I just hope he still fits in it when I finish! In the meantime, maybe I should try to finish his crochet Sonic that is only missing one leg and is in complete pieces… more to come on that. 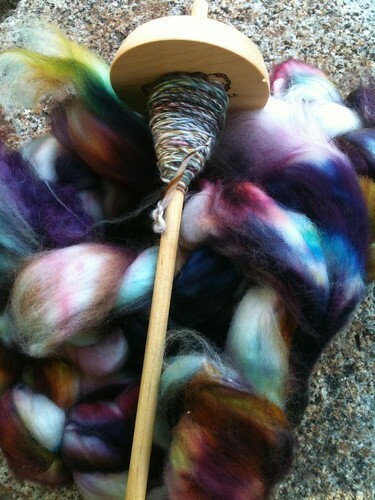 I am spinning again! I can’t believe I only got about 33 yards of usable yarn from my first real spinning project. The “second half” that I mentioned in that post went really poorly and I will probably have to scrap it. Hopefully I will get better this time around since I have officially decided that this is something that I want to get into. 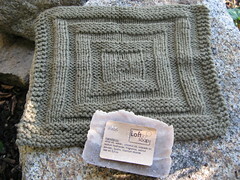 I purchased 8 oz of fiber from Pigeonroof studios, in the Lydia colorway that I found at Purlescence. The colors are outstanding, however I’m concerned that they will get muddy when I ply them together, which made think that perhaps I should do a 3 ply navajo ply rather than a 2 ply. It might help the color changes not be verrigated so randomly. Navajo ply uses one single ply and folds onto itself, like a crochet chain. So you can imagine the colors changing along with the single ply color changes, as opposed to taking the two opposite ends of my single ply and twisting them together. Does that make sense? Per my nature, I promptly searched youtube for navajo ply on a drop spindle and I found a ton of interesting videos, but had to share this one from Rosemary Knits showing how she does the navajo ply on the fly. It was truly amazing. She is so comfortable with her dop spindle. She spins a little and then stops and plys what she just spun, then repeats. I also subscribed to the FiberBeat podcast from WonderMike. I haven’t listened to any of them yet, but it comes highly recommended by QuiltOtaku and Rosemary Knits, so this is a must if I am to become a spinner. The next thing I need to do is sign up for a class!! I should really be working on my son’s birthday thunderstorm sweater!! At this rate, it will have to be a christmas sweater! Happy 1 Year Birthday Sophia! The year has flown by so fast. I swear time goes faster every year. My precious daughter turned 1 this November. I just had to knit her something special… and there’s nothing more special than 100% cashmere, right? This quick little knit is called the Langston by Teresa Cole. It is a top down raglan. I made size 18 months, so it is actually a little big on her still, but since it’s a shrug-like cardi, I thought it would be great for the spring when she’ll be a little bigger and it’s a little warmer out. The yarn is Jade Sapphire, 100% Mongolian Cashmere, always a dream to work with. I always keep an eye out for PurlSoho’s sale yarns. About twice a year they add cashmere to their 40% off sale yarn bin. This project took two skeins and I had a little bit extra. The butterfly buttons were found at Yarn Dogs. They have a great selection of buttons. It’s amazing how buttons can change the whole look of a sweater. The addition of butterflies on this sweater make me think of a woodland sprite. They added just a touch of magic. I didn’t do any modifications. If I do it again, I would add more of a ruffle on the bottom and make the edging a little longer. 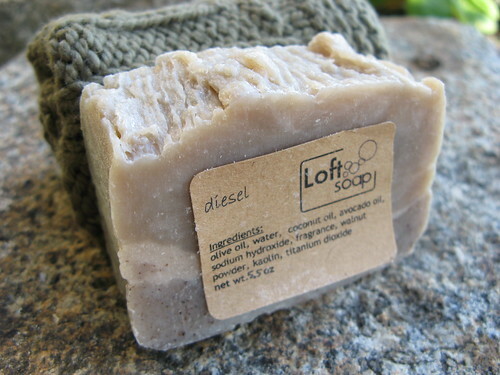 It curls up so easily and the ruffle was just so subtle on the soft cashmere. I might enjoy making a longer one as well, but for two small skeins of yarn, this length was just right. Here’s a quick update on the thunderstorm swater: I’m almost to the cloud!! Lots of car knitting this weekend. It’s knitting up quick too since it’s Malabrigo Twist on size 10 needles! I’m having a blast knitting it. I have all of the measurements written out… but I’m going to be winging it a bit as I get to the yoke! This will be my first no-pattern sweater. Let’s hope I learned something from the sweater classes that I took from Jared Flood and Ysolda Teague!! 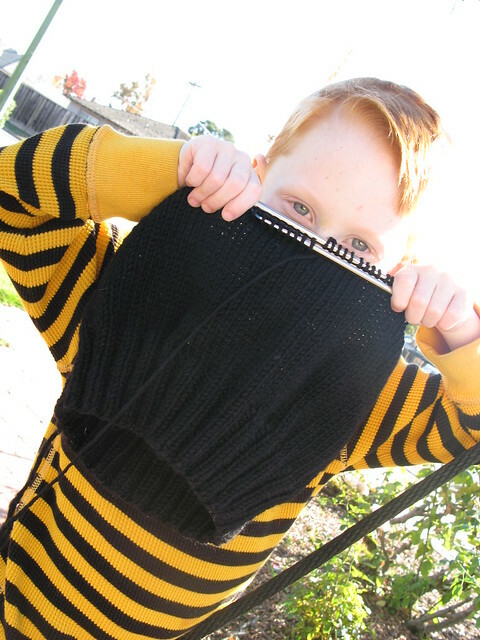 My son designed his first sweater (pictured above)! He has recently taken a big interest in my knitting. He wants me to knit everything for everyone. It is the cutest thing ever. 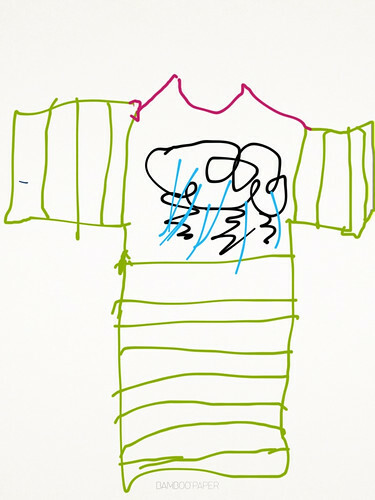 He drew this sweater, and I’m going to do my best to bring it to life… with a few modifications. The thunder cloud and rain is going to stay, but the green stripes are going to go. It’s going to be made out of black malabrigo… so, super soft, but it’s not a superwash. The cloud will be a bright turquoise, lined with silver blue with golden lightening and blue water drops. I am trying to finish it before his birthday… that gives me 18 days. Will I make it? Who’s taking bets?? I think the key is to take really long car rides on the weekends with my husband driving. He’s turning 5, such a big boy. In other news, my daughter just turned 1 a few weeks ago! I have been so behind in posting. 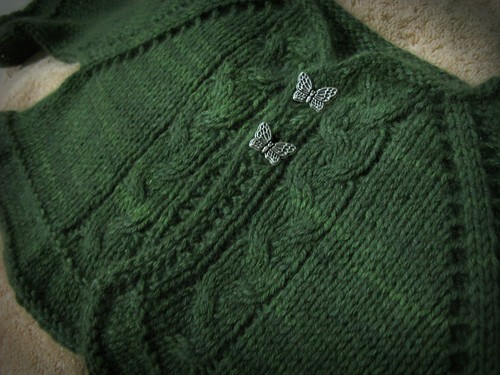 I made her a little green cashmere sweater with butterfly buttons. Pictures and post to come!